I made this photograph a long time ago – must have been around 1976, judging from the truck. The image strikes me as being very symbolic, and that’s why I have kept it in my portfolio. I imagine this couple had worked hard for many, many years and are already well into retirement – as it was known back in the last quarter of the twentieth century. The mortgage is paid up and the kids long grown and gone. 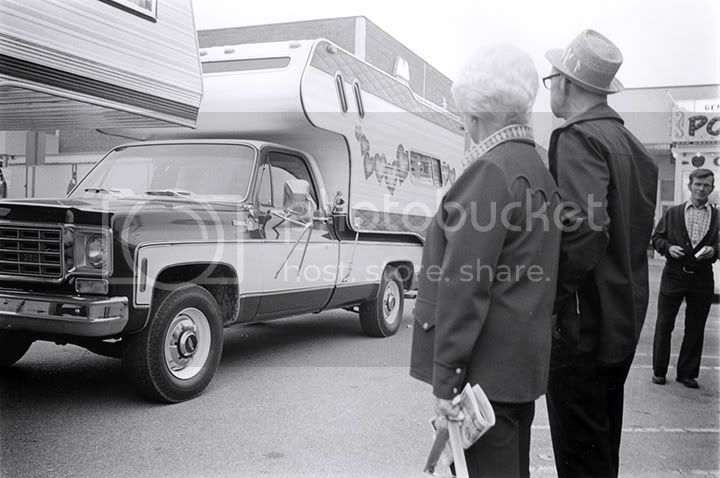 They have encountered this display and are contemplating what would happen if they should take a chunk of their savings and buy this camper with the hearts on the side. How would it feel to just take off – the two of them – across the country with no particular destination at all. Maybe drive through the Badlands and the mountains and stop by the kids’ place in Los Angeles and then circle back to the dessert where it’s always warm and dry. Somehow their clothing and their pose say to me that they will not step any closer to this machine that represents all the possibilities of a different course for their life together. They have worked too hard and are too sensible to be running around in this camper like a couple of hippies. Labels: "1976 Chevrolet pickup", "Chevy pickup truck", "Jeff Blackwell", "Jeffery Blackwell"